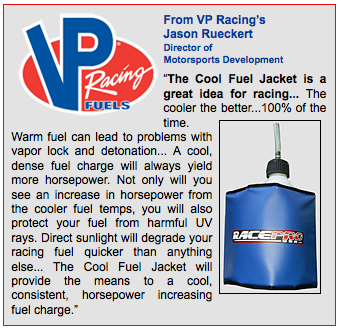 The new Cool Fuel Ice Jacket is a simple, inexpensive way to get the most power from your important racing fuel. It is easy to use and will work all day at the track. Why settle for already overheated fuel? We recommend the fuel added to your machine before the start is in a cool range of 50-65 degrees. This super insulated jacket comes with removable Techni-Ice sheets for effective and clean cooling that is reusable over and over. Simply re-freeze the sheets! It will keep the fuel cool, help prevent light additives from evaporating during the day and offer the most consistent performance and power from your engine at the beginning of the race. Works for pump fuel and racing fuels! 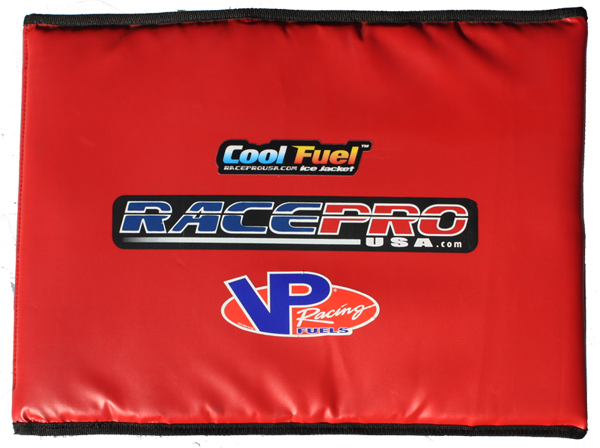 So even when your important fuel jug is overheating at the track, as quick as you can say, “Hey, cool it”, RACEPRO USA and VP Racing fuels have you covered!